Angie's List rewards Sir Grout Northern New Jersey's for their ability to deliver excellent restoration services and top-quality customer service throughout 2018. We're honored to be receiving this award for the fourth year in a row. We always make sure our customers know their satisfaction is our priority. This year, Sir Grout Northern New Jersey has the privilege of being one of the few hard surface restoration companies in the area that received Angie's List's coveted Super Service Award. Angie's List, the go-to online directory for home improvement services, grants this award to the best service providers each year. To achieve such a high level of recognition, companies must go beyond normal service standards. 2018 marks Sir Grout Northern New Jersey's fourth consecutive year as winners, which showcases how committed they are towards keeping customers satisfied. Angie's List users can grade companies on an "A" to "F" scale after hiring their services. To be eligible for a Super Service Award, a company must have an "A" rating as their Overall Grade, Recent Grade, and Review Period Grade. The grades are determined through the ratings, testimonials, and reviews provided by customers. In many cases, it only takes a company one bad review to be disqualified as a potential winner of Angie's List prestigious award. Earning this prize isn't an easy task. "Hard surface restoration companies must meet really high standards in Northern New Jersey. 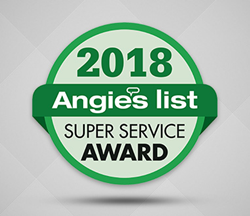 Only a small percentage of companies have performed well enough to receive our Super Service Award," stated Angie's List founder, Angie Hicks. As a result, earning this award not once, but for four consecutive years is a testament to Sir Grout Northern New Jersey's impeccable customer service. Upon learning about this recognition, this franchise's owner, Jeff Miller, stated: "We're honored to be receiving this award for the fourth year in a row. We always make sure our customers know their satisfaction is our priority. To see every client, recognize our efforts to establish a positive customer relationship and deliver top-notch services motivates us to keep going." Sir Grout Northern New Jersey has cultivated a great reputation in their area, which shows why they were chosen as one of the awardees. Through years of delivering top-of-the-line services, they became the go-to hard surface restoration company for people residing in several counties in Northern New Jersey. They offer home and business owners in the counties of Bergen, Essex, Hudson, Middlesex, Morris, Passaic, Union, and Rockland the best products and services in the field of hard surface restorations. The best way to schedule a free evaluation with the hard surface restoration specialists at Sir Grout Northern New Jersey is by visiting their website http://www.sirgroutnorthnj.com or giving them a call at (201) 571-2424.